We provide highly skilled and experienced health professionals for your aerospace needs. We have extensive resources to assist an employer with consultative expertise, medical examinations, emergency medical planning and medical monitoring. 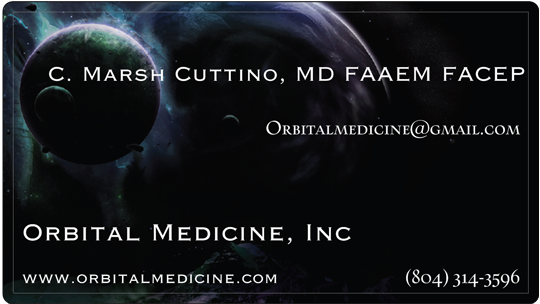 Our mission at Orbital Medicine is to provide specialized medical capabilities for microgravity research and spacecraft flight operations. Our areas of research include those of emergency response capabilities and research and development of medical devices, techniques, and medical response capabilities for the aerospace medicine community. Orbital Medicine helps NASA and the commercial spaceflight industry create, develop and test medical devices and procedures to ensure a safer space exploration capability.